A zoo is a place where different kinds of living animals beasts and birds are kept. It is a place of great interest for all particularly the students. By paying a visit to a zoo, people living in cities can have knowledge of different species of the animal world. The zoo in Lucknow is located near Hazrat Ganj. Last year I happened to see it with my father. The entry to zoo was by tickets. We bought tickets and entered the zoo by the main gate. We started from the right hand side. There were deer, stags and blue cows. These animals came to us I the hope of getting something to eat. Then we saw two rhinos standing in cool muddy water. We then moved to the next section of the zoo. There were wild animals like lions, panthers, tigers, leopards and bears. They were in separate cages. It was tried to create natural living condition for these animals. Then we saw monkeys and chimpanzees. They were also in separate cages. Then we saw kangaroos, zebras and a giraffe. A white elephant was also there. We saw wolves, hyenas and jackals in their separate cages. I enjoyed elephant ride there. We saw water birds like cranes, swans, ducks etc. Then we saw birds kept in big cages. Parrot from different countries white peacocks and other beautiful birds of different kinds attracted a large gathering. We saw a pond in which crocodiles were swimming. Nearby was the enclosure for snakes and cobras. They were of different sizes and colors. Tired as I was, I lay in the shade of a tree on the green grass for relaxation. 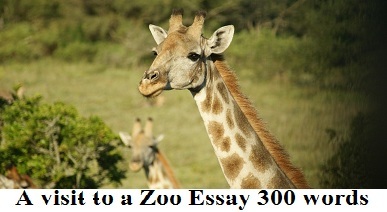 In fact zoo is a place of education as well as of entertainment.